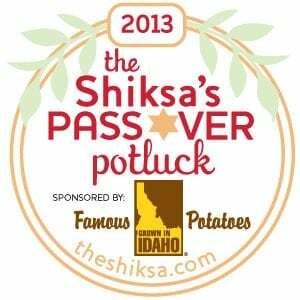 Our lovely Passover Potluck badge for 2013 was designed by my talented friend Brenda at Secret Agent Josephine. This year, we are lucky to have Idaho Potatoes on board as our featured sponsor for the Potluck! Follow them on Facebook, Twitter, YouTube and Pinterest. Download the size that best suits your needs. You are free to share the badge via your blog, website, Facebook, profile picture, Pinterest, or any other social networking website. If you plan on writing a post directing readers to your guest post, please include the badge in your post.